Hello! 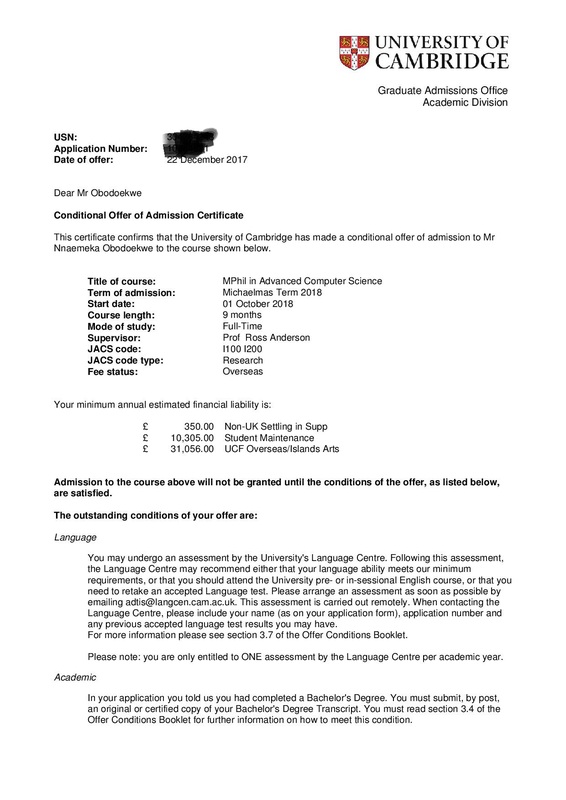 My name is Obodoekwe Nnaemeka, I recently got admitted to the University of Cambridge for an MPhil in Advanced Computer Science and I earnestly need your help to meet the financial requirement of my admission. My study at the University of Cambridge will explore the use of computer systems to enable the solutions to some of the prevalent problems in Africa. Unfortunately, due to the high cost of tuition at University of Cambridge for international student, this dream is almost slipping away. Hence, I am using this platform as my last resort to plead for your help in meeting the financial requirement of my admission. Please find below a breakdown of my tuition. Also attached is my admission letter which states these figures. I have to confirm that I'll be taking up my place, and pay my tuition and college fees up front, by August 1st 2018. My motivation to study Computer Science came from a goal I set as a teenager in Nigeria to use software solutions to improve lives in Africa. At the point of setting this goal, the only knowledge I had about computers was through international technology news. My goal was set in motion when I received a scholarship to go study Computer Science at the University of Johannesburg. I graduated as the best Computer Science student in the University of Johannesburg and was also recognized by both Microsoft and mybroadband.co.za as the best computer science student in South Africa, 2015. In 2016, I was nominated by Gartner and MTN business as an African Aspiring Innovator for my research and development of software solutions that tackle problems in Africa. On completing my studies, I have been actively working towards my goal of developing software solutions that enable the solutions to some of the prevalent challenges in Africa. Thus far I have developed software systems, such as a fraud detection system to improve transparency in African government procurement system (use case South Africa) and an epidemic detection system for the healthcare sector which can easily pick up potential health epidemic such as the case of Ebola before an outbreak. When I applied to the university of Cambridge, I thought that I barely stood any chance as only 30 students out of the average 1200 yearly applicants worldwide gets chosen. After the long and tedious application process and interview, I was selected among the 30 students to pursue an MPhil in Advanced Computer Science. My study at Cambridge will enable me to gain the world class skills to continue to research and develop these software systems that will enable the solution to some of the prevalent challenges in Africa. I also intend to use the platform I have created to continue empowering other African youths in information technology which I am already doing through the free information technology foundation course I run in Nigeria and South Africa. I have done everything within my own ability to meet the financial requirement, but with the amount due, I need all the help I can get. My time is limited, as I have until the end of June to meet the financial requirement. My admission will probably be terminated soon after that. I have also applied to several scholarship but as these scholarships are highly competitive and only a few available to Nigerian students. 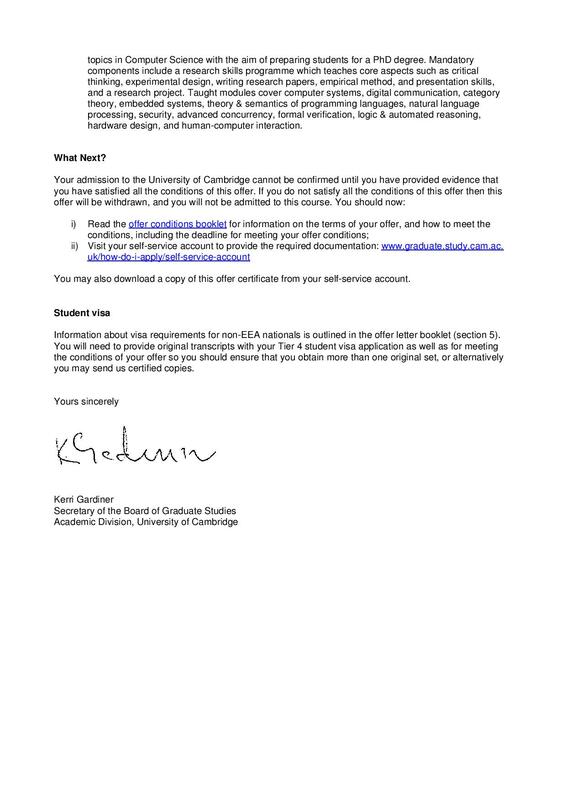 I believe that my study at the University of Cambridge will give me the technical skills and the international network to play a more effective role in the growth of information technology in Africa. In my first year of study I was advised by my lecturer to change my course as I had no computer background and she never thought I’d make it past my first year of study, but through hard work, perseverance and the Grace of God I excelled with flying colours against all odds. To have it all end now, like this is a feeling I have no words to adequately describe. But I'm hoping that I do not have to experience such crushing disappointment. I have a strong passion and commitment to my continent; Africa and I want to use this means to empower myself to be able to make more impact in my continent and create more opportunities subsequently for others. I love what I do and would choose this repeatedly if I had to. I'm not one to give up. I never have been, and I don't want to start now. Realistically speaking, I understand that the odds are stacked very highly against me. Notwithstanding the result of my plea campaign, I want to in retrospect, be able to honestly say that I fought as hard as I could for this opportunity. More than anyone else, I also know how impossible all of this looks. But even though I've run out of options, I still have a little bit of hope left. I will really appreciate any effort towards achieving this goal. No amount is too small. Please help if you can and even if you can't, then please, share this page as widely as you can. I'll also appreciate prayers and well wishes in this time. Thank you for taking out time to read. You'll be invited to join my blog which I will run throughout the duration of my course at Cambridge detailing the summary of what I learnt at the end of every week. To be invited to my blog, a personalized thank you message as well as a picture of me after my final exams. To receive all the above plus a signed and professionally bound copy of my dissertation at the end of my study.